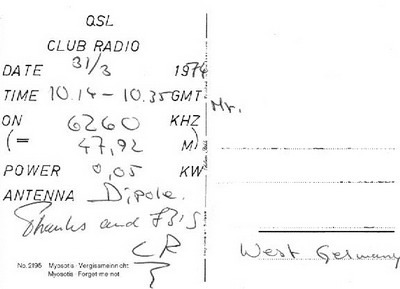 This station appeared for the first time the 10’th of March 1974 on 6235 and 6260 kHz with hard rock-programs. The transmitters should have been a home build crystal one with 75 watts possible output. They had a 2 x 12 meters dipole antenna. The station began their transmissions with the title “Incredible Bongo Band”. First they was connected to SIRA in England and later on to FRL. Some rumours says that this station was stationed in the same block as Radio Continental.